Big companies may have tons of money and time to throw at landing page design and testing, but it’s a safe bet you probably don’t. However, you shouldn’t let that stop you from putting to use all the lessons the big companies paid to learn. You can create landing pages that visitors will be thankful for, pages that deliver on what is promised and provide the information the searcher seeks. We find that landing pages designed to convert is the least understood aspect and most under used tool of internet marketing among our small business clientele. Business owners tend to get all excited about online advertising and using SEO to rank at the top of Google but then forget the most important part: what are you giving the visitor once they click on your ad or number one ranked listing for “xyz” keyword; what does the page that they land on say or offer. Think about your own search experiences. Have you ever clicked on a tempting text ad, only to land on a page that at first glance has nothing to do with the ad, is overwhelming with choices or is just the company’s lackluster homepage? What did you do? You left. Think about your own online advertising experiences. Have you ever spent money on banner ads or text ads, only to find that they did nothing to change your bottom line? How much time did you spend creating those ads? Now how much consideration were you giving to where you were sending people who clicked on those ads? Did you send them to your home page? Did you send them to a page that had MORE than what they were actually looking for? Delivering on the click is known as post-click marketing. It’s what you get the visitor to do after you convince them to click. It’s what you do to get them to buy, signup, call—in other words, convert into a sale or a lead. Start with a strategy and think it through. What is your goal? Sales, leads, subscribers? Who are you trying to appeal to? Really think about who your ideal conversion is and plan for them. Remember you have limited time and budget…you can’t appeal to everyone under the sun. Focus on the audience that is most important to you at this time for this specific offer. You can always create additional landing pages to appeal to other segments. Does the landing page fulfill the promise made in the ads or social media links. 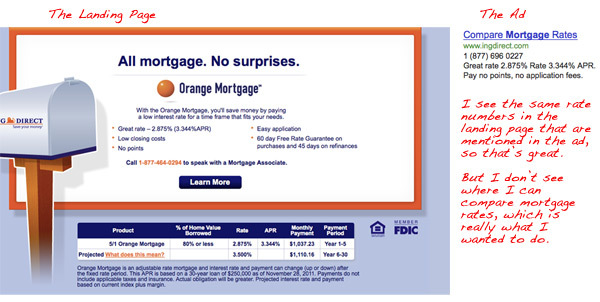 Does the landing page’s overall message match the message in the ad or social media links? This is one of the most important things to inspire trust in your visitor. If you tell them in the ad they are going to save $30/mo and then there is no mention of this savings on the landing page, you have not only lost them going any further, but you may have made them distrustful of you in the future. Interestingly enough even large companies can get this wrong; but then they have pricey TV ad budgets and their household name status to fall back on. 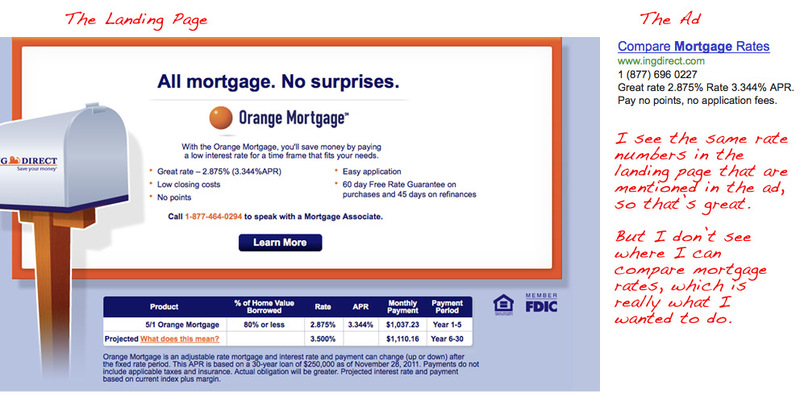 Here are three ads and their associated landing pages for the search: “refinance mortgage”. Which would get you to take the next step? Message match is only the beginning. Now you must consider how to make what you have to offer so irresistible, that visitors will feel compelled to take the next step. What does a potential customer want to know? First of all they’ll want to know clearly what the product or service offer is. Be upfront. But then they will want to know why they should care. How is your offer different, why is this the offer for me, why do I need this. And finally, what is the next step and how committed am I by taking this step. It’s important to provide signs of trustworthiness such as awards, testimonials, and trust marks that indicate good business practices or association with reputable organizations. Write your copy in a tone and style that will appear authoritative to the market you are targeting. It should be customer-centric and focus on the visitor and how you can help them. Hire a copy writer if necessary. Make it easy for your visitor to take the next step. If you have only one CTA (Call to Action), is it obvious? Does the visitor have a clear indication of what will happen once they click on it? If you have more than one CTA, are they clearly differentiated? Can the user easily make a knowledgeable choice. If the decision becomes hard, prospects tend to leave. Do you have too many choices on your page? Having more than one CTA is okay but if you have that and your site’s main menu and 2 videos, your visitor may get distracted and never return to the goal. 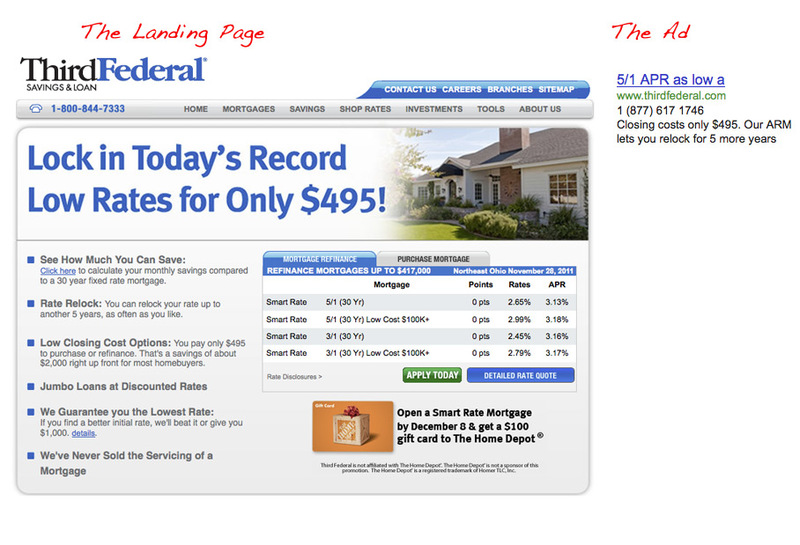 Landing pages visitors are thankful for ultimately satisfy a need, either for information or action. You job as a marketer is to figure out how to make their needs dovetail nicely with your own. Nice work, Lisa! Especially on that Fogel Law Group site!